Note from Mr. FishDuck: We do not have a video this week, but instead a look at one of Oregon’s basic Spread Offense plays as run by the Philadelphia Eagles, reported by Coach Adam Dawkins in England! We welcome guest coach analysis and do email us at charles@fishduck.com if interested in joining the fun, along with giving us your feedback about the Eagle offense at the end of this article. 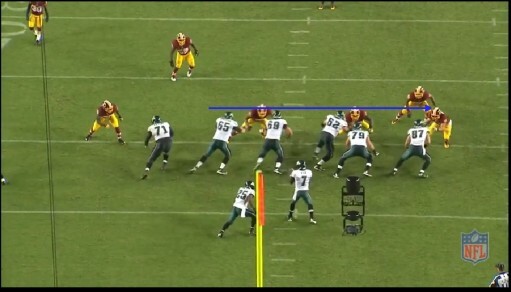 The Philadelphia Eagles offense under Chip Kelly retains many of the same characteristics as its Oregon counter part, and at times the Eagles look as though they are the Oregon football team, as pictured above lined up for a traditional Oregon-style Inside Zone Read. The Inside Zone Read still appears to be a staple in the offense, but we have noted that it already takes on a few different forms early in the Philadelphia season. One such form (above) is the Backside Trips IZR. This play is still going to be a handoff to LeSean McCoy to the right hand side, as he and Michael Vick are lined up in an IZR backfield formation. The backside trips formation presents several possibilities for the offense that may not have been possible in the traditional spread formation. The defense is actually only spread to one side, because on the play side of the formation (the Eagles’ right) the widest defender is on the hash marks. With McCoy’s vision and open field ability, it’s not surprising that Kelly wants to find him a lot of space to the wide side of the field (note that the trips are to the boundary — the shorter side of the field). Despite the narrower hash marks in the NFL — we see that with this adjustment, the formation still achieves the key objective of the Spread Offense for the running game: to keep defenders out of the tackle box. Spreading them out in the NFL . . . 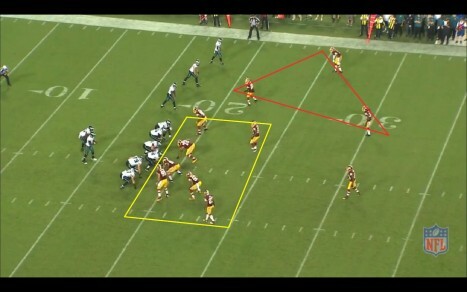 The Redskins (above) appear to be lined up with three men in a zone coverage over the trips formation, and seven in the tackle box (weighted to the Eagles’ right side of the line). 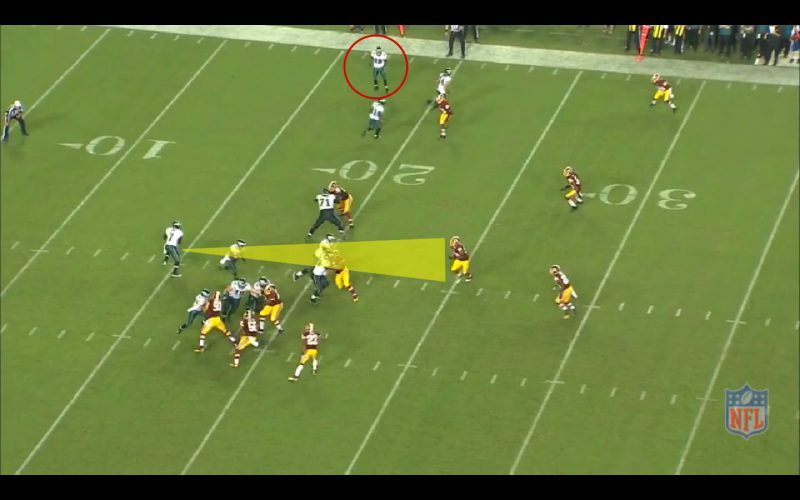 This actually presents Michael Vick with a pretty good look either way, as the Redskins have had to sacrifice some of their pass coverage to keep seven in the box. If DeSean Jackson (the inside slot receiver here) goes deep on a wheel or go route, he’ll essentially be in one-on-one coverage down the field. This defensive alignment could be GOOD-or-GOOD for the Eagles! When the play gets underway, Vick hands off to LeSean McCoy, who runs to the right side; but the blocking scheme is also a little different than the traditional Inside Zone Read. The right side of the line (above) operates with typical Inside Zone run blocking with the double teams about to form by No. 65 along with No. 69, and No. 62 along with No. 79. But, surprisingly, the defensive end on the back side isn’t released, but is about to be blocked by left tackle Jason Peters. An unusual twist . . .
As the play develops, we see (above) that Peters (who is a good run blocker) takes a pass protection approach to his block? It’s difficult to say exactly, when it is so early in the season. One of the core philosophies behind the Kelly offense is to be able to do several things with the same formation and play. In this instance the trips on the backside of the play are set up for a bubble screen, but you’d expect there’s a deep passing play tucked away in there too, and maybe that’s why Peters is pass protecting? One option, as I’ve diagrammed, is that Vick could be reading a different player such as the middle linebacker since it IS something that Kelly did at Oregon on occasion. Maybe it’s a pre-snap read of the formation and the handoff occurs regardless? If you write this play down on paper, you can quickly come up with three to six different desirable variations that could be in Kelly’s playbook. Personally, I think it’s likely that the personnel component plays a part in this strategy. 1. 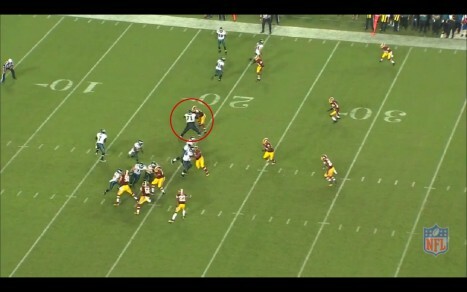 This variation gives McCoy space to run to. 2. 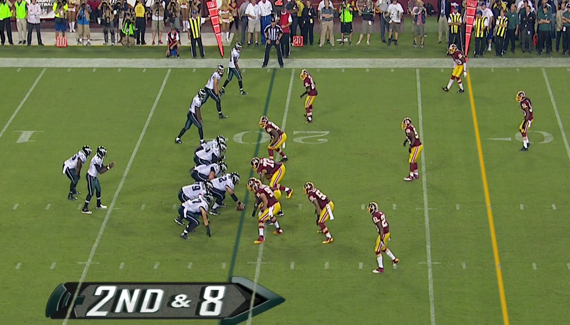 This variation makes it hard to double-cover DeSean Jackson in either the Bubble pass or long-ball. 3. Michael Vick is 31-years old, and has only completed a 16-game season once in his career. If you leave the backside defensive end uncovered, you expose Vick to more hits which is something the Eagles don’t want to do. I would love the feedback of those who have studied the Oregon offense, as I have, for your thoughts on what Chip is up to. *Want some Philadelphia Eagle/Oregon Football humor? Check out FishDuck.com’s GIF “Who is Driving the Bus?” (Click here) If it is not the best GIF of the season for you–it will be in your top three! Pass it along!